Senran Kagura Peach Beach splash is the kind of shooter game you should play if you like your shooters non-violent. See, in this game, all you do is shoot water pistols at your opponents. Totally innocent, right? I mean, in an era where apparently gun crime is because kids play violent shooters, it only makes sense to get them playing games with water guns, right? A couple of wet textbooks is about the only consequence if a kid takes one of those to school with them. Well it would have been if it wasn't about the Senran Kagura ladies, and we all know the direction their games tend to go. This one was no different. Fan service to the max and probably not something you'd want to be seen playing in public, it's all misdirection because the game's big secret is that it's actually a lot of fun. You can read our review of the game here. The only thing putting me off buying the game myself (aside from a crippling lack of time) is the cast. I like the Senran Kagura girls enough, but I don't generally go out of my way to chase these games. That's slowly changing, though. 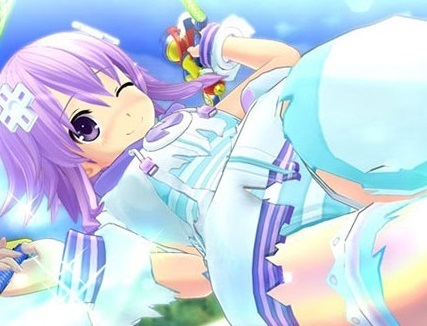 Last year Marie Rose from Dead or Alive was added as a DLC character, and today we got the wonderful news that Neptune, from Hyperdimension Neptunia, is also going the party. She releases in Japan on March 8 (no word of a western release just yet), and comes with all the swimsuits and so on that she'll need to look the part on these particular battlefields. It'll be interesting to see if this is the last bit of DLC, or the developer has more planned for down the track. I rather like the idea of this spinning out to become an "all stars" style water gun game.